Such crazy weather! Snow, then arctic temps with more snow! Rosie, Jeffie and Rudy loved it all. The Talking Dogs version of tag was very popular. 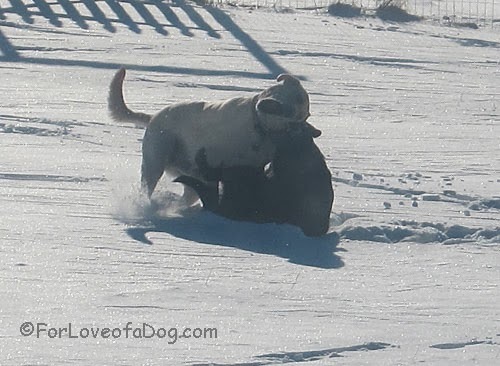 Why bite snow when you can bite one another?! I think, maybe, Jeffie is "it." Of course, just jogging around is fun, too. 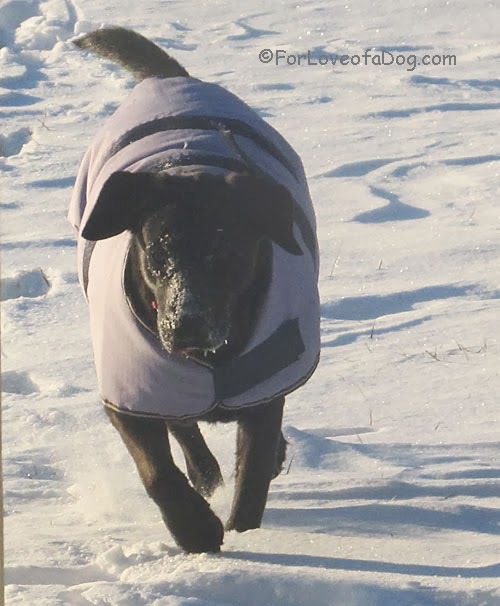 Love Rudy's new EzyDog elements jacket! Sticking her face into the snow as deep as she can. Oblivious to that white stuff on her face. 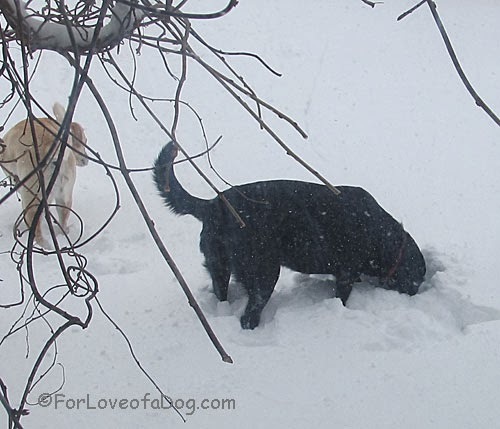 My dogs love sticking their faces in the snow. Your Rosie reminds me of my Lilah, who is also all black. 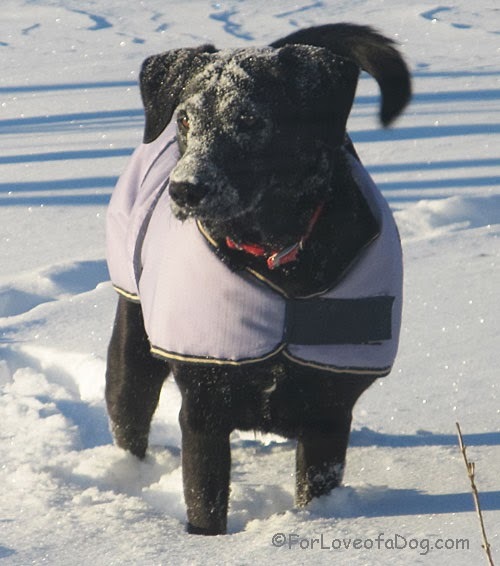 When she picks her muzzle up out of the snow, she reminds me of a powdered donut! Live with dogs? Cats? Both? 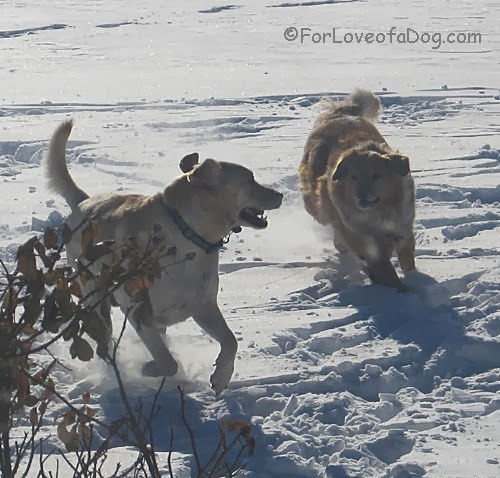 Join the Google+ Community, Life with Dogs and Cats!. 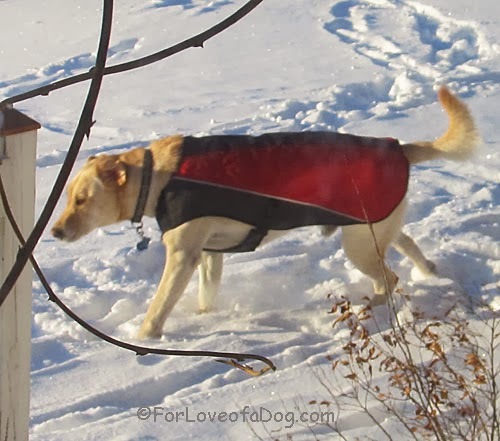 Good gracious, with all that snow you really need those snazzy jackets! Wonderful photos, lots of joy there. LOL brought a smile to my face. We have been having freezing cold, snow and then two days later it is 50 degrees. Winter can't make up its mind. Looks like they had a blast! I wish we would get some snow here in Tennessee. 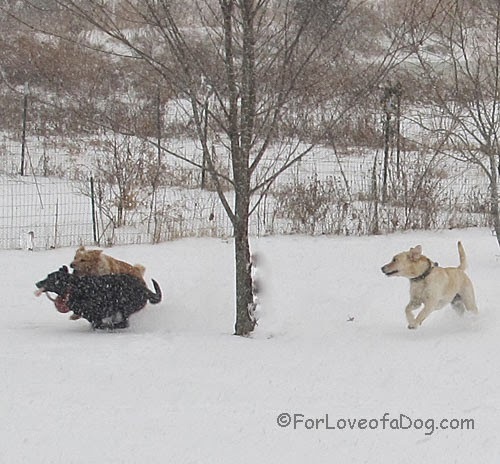 I have a 4 month old golden retriever that I'm sure would love to frolic in the snow. 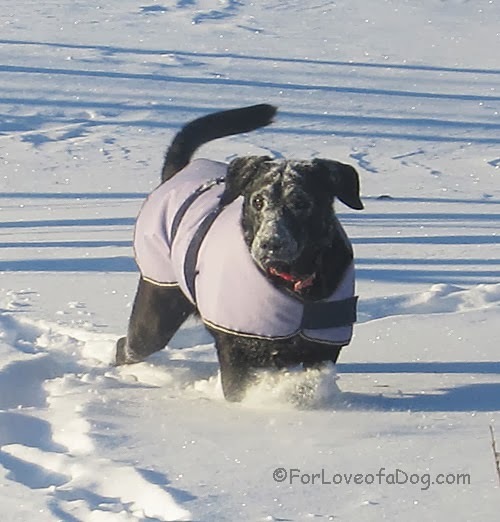 I bet your puppy would LOVE to romp in some snow! However, be careful what you wish for... all this snow is very unusual for our area of the Ozarks and the cold set 40 year records! Yahoo!!! 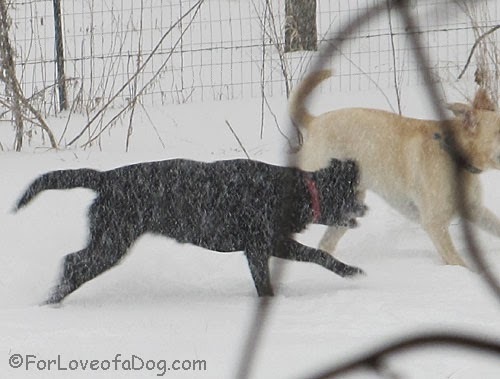 I just love to watch the dogs playing in the snow, and yours really seem to enjoy it! Most of our snow has melted or washed away, I hope we'll get some fresh stuff soon. That looks so fun! My dogs bite each other too! looks like you were having a ball! Happy New Year - WOOF WOOF! How did I almost miss this post? They are all so cute!!! I love their jackets too. Maya and Pierson don't have jackets. With as cold as it has been lately, I should consider.